Results: With Or Without “Limited Time Offer” Seal? With Or Without "Limited Time Offer" Seal? 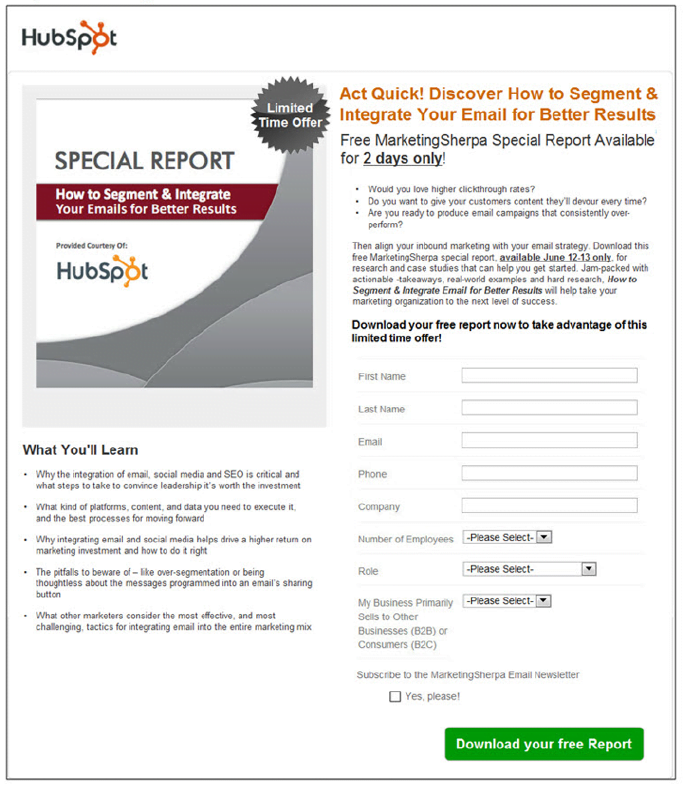 MECLABS, the optimization research institute, worked with HubSpot, the popular Inbound marketing platform, to run this fantastic form completion test. The test was put together during a live Marketing Summit, led by MECLABS. 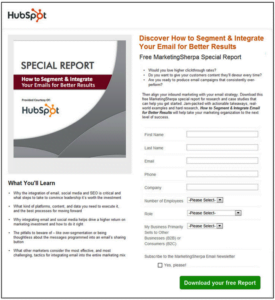 At the Summit, marketers had the opportunity to suggest the best elements to test, to optimize the Hubspot landing page. The test goal was to increase the number of leads filling out the form and the downloading report. The Summit group came up with many fantastic testing ideas. Some of the suggestions included reducing form fields, showing the monetary value of the report, and optimizing the image of the report cover. Ultimately, it was decided adding urgency — by prominently placing a “limited time offer” seal near the report cover — would be a simple, yet valuable element to test. The team suspected communicating urgency would result in more leads completing the registration form, to get the report. However, it was also acknowledged adding urgency could turn away hesitant viewers, or might simply have no impact at all. To assess the impact of adding a “limited time offer” seal, an A/B test was set-up and run on Hubspot’s platform. The test began during the Summit and continued until statistically significant results were achieved. During this time, email and social traffic was split 50/50. Lead form completions — which counted as people filling out the contact form and downloading the report — were tracked across both versions. Winner: Version A — with the urgent “Limited Time Offer” seal truly sealed the deal. The result is, perhaps, not overly surprising. But, what is eye-opening is that simply adding a seal, stressing urgency, increased lead form completions a strong 6.8%, compared to the version without the seal. Results achieved 97% confidence. Time-sensitive, limited-time offers work because we have FOMO — Fear of Missing Out. In fact, FOMO has become so pervasive, it’s now a term recognized by the Oxford dictionary! And, there’s countless articles talking about FOMO and its adverse affect on our society. Many researchers argue, FOMO leads to cell phone addiction, unhealthy social media habits, and even sleep loss. And, while FOMO may be negative, it’s not our fault. We’re psychologically wired to experience anxiety when we feel like we’re missing out. For our ancestors, this reaction was actually really valuable. It helped us survive. We were better able to react to urgent situations and make the best use of scarce resources. Today, maybe not so much. . . But, smart marketers can tap these basic evolutionary traits to motivate and persuade people to act — now. This A/B test by MECLAS and HubSpot supports the idea that marketers can motivate action by getting users to take advantage of an offer — before it’s too late, or gone. However, it’s important to note, stressing urgency, or scarcity, won’t always work. If the tactic comes across an inauthentic or forced, it may prompt users to question the trustworthiness of the the offer, or website. As renowned digital psychologist, Brain Cugleman of AlterSpark explains, if trust is violated, users simply won’t convert. So, use urgency and scarcity, well, scarcely. And, with authenticity. Stress urgency to get your visitors to act — now. Make users feel like they’ll miss out if they don’t immediately take advantage of the offer in front of them. If done with authenticity, using urgency can be a valuable conversion tactic. Looking for more great tests and tactics? Become a Pro Member. Want to know what's involved?